This month sees the highly anticipated issue from Vogue magazine with arguably one of the world’s most glamorous and photographed couples gracing the front cover. Kanye West and Kim Kardashian are huge in the world of fashion and Hollywood, and have for nearly a year now been designing and rebuilding their new home together. They have done so much to the property that it was arguable as to whether it would have been easier to build a new property from scratch instead of converting. Swarovski Crystals Should Be Used Everywhere! This brand is name-dropped twice in the Vogue article. Kris Jenners home (Kim’s mother where they are currently staying) has “Jet-black” crystals tie back curtains in the entrance hall, and crystal and sparkle is evident everywhere. 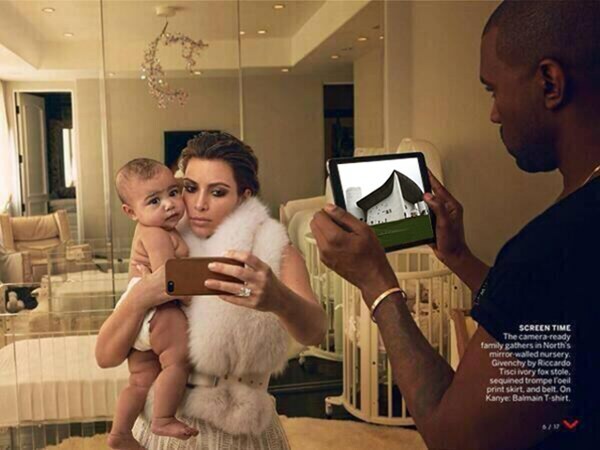 Attention to detail is key with ‘Kimye’. Vogue notes that the couple redid a newly remodeled bedroom in Jenner’s house for the baby. Along with a designer crystal chandelier, the baby also gets shag carpeting, a Lucite crib, and full mirrored wall. Kanye West has already said that he works with five architects at a time, with acclaimed professionals including Claudio Silvestrin and Oana Stanescu. West says that architect Silvestrin always advises on his and hers bathrooms “I’ve been through three marriages—and we need to have two bathrooms!” Happy couples in the bathroom make for a happy life! For help creating your own dream home with bespoke fitted bedrooms and luxury bathrooms visit the Langley Interiors furniture showroom in Bolton. For an appointment with the senior designer Peter Langley please call 01204 525432.